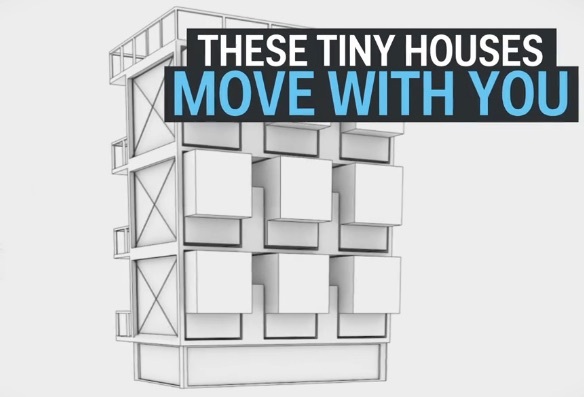 Tech Insider just released an article about these tiny homes that move with you! Thats right, transportable homes! These homes amount to 208 Sq. Ft. with 10 foot ceilings and are designed to slide into larger structures in cities. Think of a giant building that looks like a drawer, with 9 evenly proportioned compartments that are little homes that pop in and out. Sure that would clear up some space in the city and be a new, innovative way of living! The company claims they’re about half the market rate for a studio! Now, you may be wondering what in the world could you fit inside? Well inside these homes you’ll find: a shower, fridge, oven, dishwasher, washer and dryer, cooktop, and queen-size bed. Smart home tech is also built into the walls, where you can use voice commands to do things like change lighting, play music, or roll out the bed. The tile design also lets you customize the space. Move compartments such as :speaker tile, built in shelves, compartments, plant holder, fire pit, bike rack, and more! Now it seems like these homes come equipped with the works, total modern everything! Get this, when you are ready to move cities, take your home with you, with a tap of a “move” button on an app. They put your home on a big rig and move it out. Coming to Austin, Texas in 2016, with more major cities on the way.